With the freezing weather we are experiencing this winter, I find myself preparing soups on a daily basis. One of my favorites is this chicken noodle soup recipe. It is very easy to prepare and filling. I usually make it the day following a chicken roast. I use the rest of the roast as a base for my soup. It makes a perfect chicken stock and adds so much flavor to the soup. This chicken noodle soup recipe is also my daughter’s favorite lunch. She enjoys this hot meal with crackers on the side. Who doesn’t on a freezing day? I cannot believe how harsh this winter is! My scarf literally freezes when I walk my daughter to school. Since we cannot change the temperature, let’s see how we can stay warm. 1/4 cup of shredded chicken. I use the remaining of my chicken roast. If you don’t have, use chicken breasts. 1/4 of frozen vegetables: I use the one that has peas, carrots. 4 cups of chicken stock. I use my chicken roast as a base for my chicken stock. But you can use any store-bought chicken stock. Once water boiled, add the frozen vegetables and the noodles. That’s it. As easy as that. If you are a little more adventurous with taste, add some Curry paste to your chicken stock. I love to spice up my meals with curry paste. Sometimes, I add some Tabasco. I am fond of spicy food, like my curried sweet potato soup! I love the way the curry helps warm me up! Both soups go great with some homemade garlic bread. 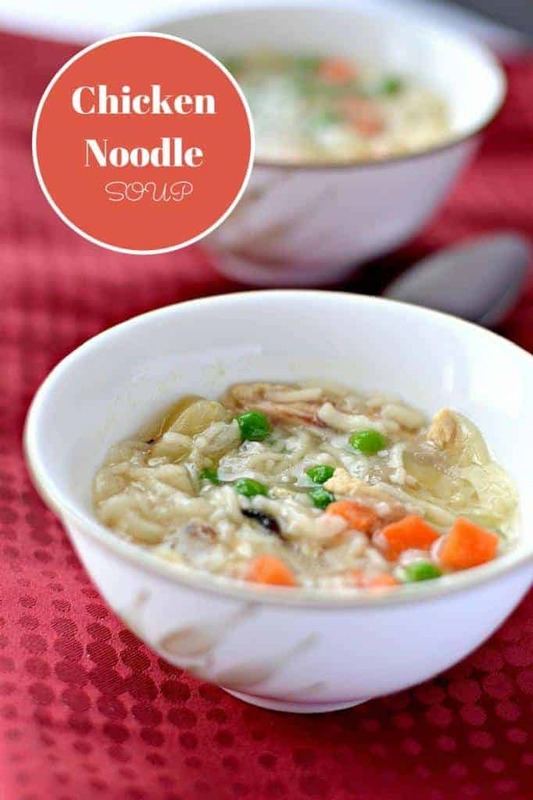 What do you think of this chicken noodle soup recipe? Are you eating a lot of soups during this frigid winter? I won’t be adding any curry nor Tabasco though as I can’t eat spicy foods. My favourite soup ever is chicken noodle. thanks for sharing. I’m pinning! Wow this looks delicious, definitely one making!!! I use almost the same recipe with a little less broth and serve over mashed potatoes with some crusty bread. My family loves it! 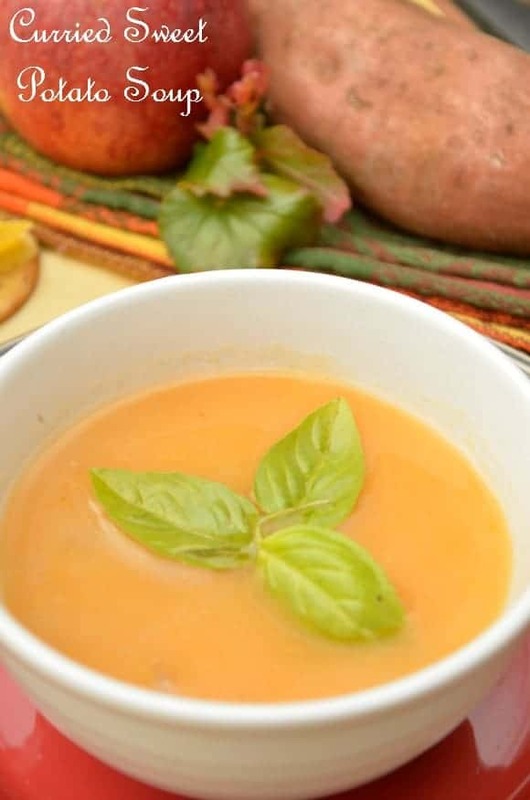 thanks for sharing this easy recipe; love soups on cold days. These soups look great! Great for a cold day! The chicken noodle soup recipe looks awesome. 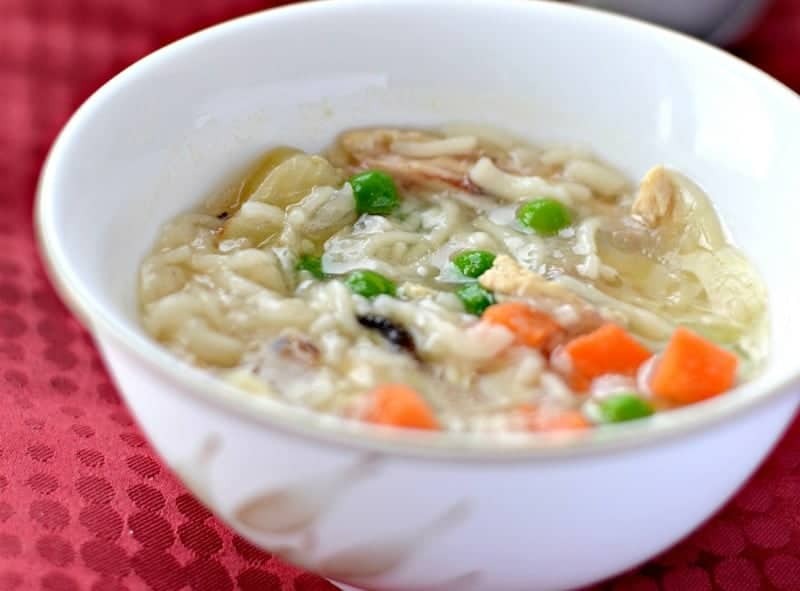 What a nice and simple recipe for chicken noodle soup. I love soup anytime of the year and this would be a great one to make. This definitely sounds delicious. Will have to try out the recipe. This soup looks so good. It would be a nice meal to have on a cold winters day. Thanks for sharing. Always love a good bowl of homemade chicken soup, thanks for the recipe! Yum! Looks like the perfect thing to make to warm us up during this awfully chilly spell. Your chicken soup looks wonderful! There’s nothing like a good bowl of hot soup in the winter! And the curried sweet potato soup sounds amazing too! This looks so yummy! A perfect recipe for cold weather! delicious! Thanks for sharing on the Monday Funday Party. Pinning to our Monday Funday Pinterest board. Oh this sounds really good. There’s nothing like a good chicken noodle soup especially when you’re feeling not so good. Oh that sounds great right now. It is freezing outside, a nice way to warm up! There’s nothing more comforting than chicken noodle soup! This recipe looks and sounds delicious! This looks really good! My family loves chicken noodle and I try to get them to try others. But they love that best. Yum! This soup looks really yummy. I need to make this on Monday. I will be nice with the cold weather moving in. The soup sounds good. I think you’re right a nice slice of garlic bread would be great with it. There is nothing better than a pot of handmade soup on a cold winter’s day. This recipe is going into my book to make soon. There is nothing like a good bowl of chicken noodle soup! YUM!!! Nothing better than the classic Chicken Noodle Soup, especially with how cold things have been; this recipe would be perfect! Ooh, I love chicken noodle soup. Nothing better on a cold night or when you’re feeling sick. Chicken soup is so good for you if you use real chicken stock that’s homemade. I can’t even eat the canned stuff. It just tastes awful. I’m spoiled by homemade soup, I’ll hurl if someone gives me anything other than homemade. I love homemade chicken noodle soup! It’s perfect for cold weather, or for actual colds! I am so going to try this recipe. I have been looking for a really good one for Chicken vegetable soup. It is so cold here in Pennsylvania that soup are tops on my list. Oh yum I have to admit I love a good soup in the winter and this sounds delicious! Beautiful pictures. I have made two soups this winter and I never make soups. These looks great. I love chicken noodle soup when I am sick. This recipe sound phenomenal.